Could the E.H.T. produce an image of the human artifacts on the moon? Two days ago the New York Times featured the Event Horizon Telescope (E.H.T. ), a huge virtual radio telescope emerging from combining data from several dishes scattered around the world. While the E.H.T. is designed and built to observe black holes, specifically Sagittarius A*, the article claimed that the E.H.T. could "spot a doughnut on the moon". This was probably just meant as an illustration of its enormous resolution, but: Could it? I'm aware that the moon is not a radio source but it was apparently possible to make radar images of its surface using reflected radar radiation from one of the involved dishes. Would something like that be possible with the E.H.T.? Could we "see" the landing sites from earth? Left behind rovers, descent and ascent stages? This is a really interesting question! tl;dr: A definite maybe, but you would have to engineer a clever way to focus the transmitted power to a much smaller spot first; possibly several orders of magnitude smaller than what any one dish can do. Phasing several widely-spaced dishes alone would not be enough. Let's see what can be checked easily. Using round numbers of $f$ = 300 GHz, $c$ = 3E+08 m/s gives a wavelength $\lambda$ of 1 millimeter. With a baseline $D$ = 10,000 km, the angular resolution $\lambda / D$ is 1E-10. At a lunar distance $L$ of 360,000 km that's a resolution of 36 millimeters. Not only could you spot the donut, but the donut's hole would be resolved (barely)! The second image in your linked article New Radar Images Uncover Remarkable Features below the Surface of the Moon include images of Luther and Aristillus craters which are one and five million centimeters in size, respectively. The images already look noisy at this scale, so going a factor of 1E+05 smaller in resolution is likely to require a stronger transmitted radar signal, as measured in focused power per unit area on the lunar surface. You might think that that can be fixed by making many of the EHT dishes (distributed across the globe) into transceivers, using very long baseline to focus the radar spot's power, and that could work to a limited extent but the problem is that it would not work the same way a filled aperture works. A sparsely populated arrayed aperture will still put most of the power into a plethora of ugly sidelobes. There is a name for exactly this problem. I can't remember it now but I'll look for it. In the question Why was the 100m Green Bank dish needed together with DSN's 70m Goldstone dish to detect Chandrayaan-1 in lunar orbit? I talk about the use of two very large dish antennas to image detect the existence of a small object at the lunar distance. The experiment is described here and here as well. They used two "tricks" to make this feat possible with only two dishes. The DSN's Goldstone 70 meter dish transmitted the signal, and the large diameter of the dish made it possible to put most of the transmitted power into a circle which intercepted the spacecraft at its maximum elongation from the Moon (shown below) so that very little of the power would intercept the much larger Moon. 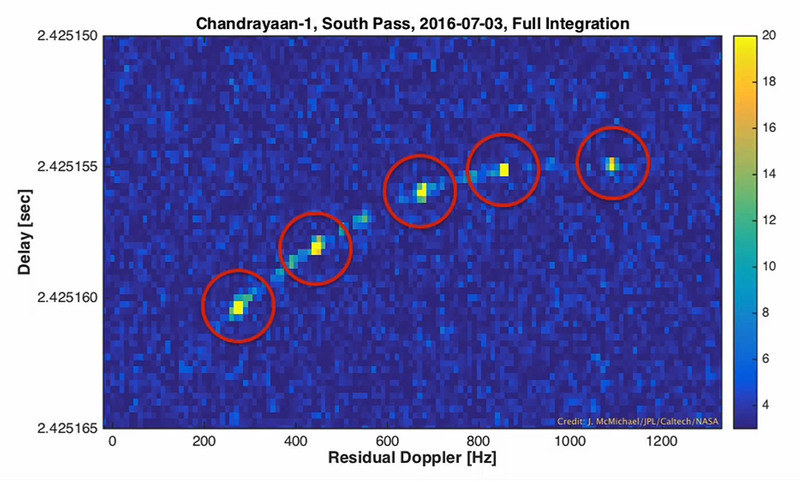 They took advantage of the Doppler shift of the reflected signal caused by the spacecraft's orbital velocity to further separate reflected signals from the Moon from the reflected signals from the spacecraft. Not the answer you're looking for? Browse other questions tagged the-moon radio-astronomy interferometry or ask your own question. What is the maximum transmission distance of the radio signal in the outer space which could still be understood? 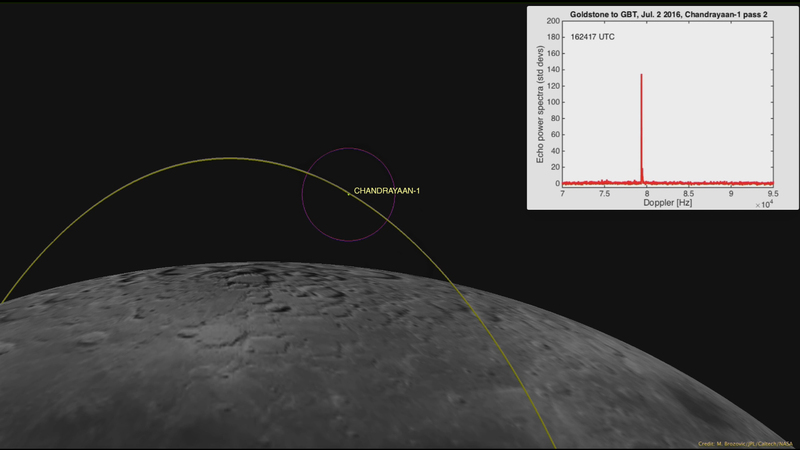 Can impact craters on the moon act like giant radio telescopes? Can radio telescopes such as arecibo image the subsurface of asteroids or planets? Are these parallel lines I'm seeing in this image a real pattern on the Moon? What is the highest resolution image of the moon taken from Earth's surface? What are the challenges for the building and data analysis of the CHIME telescope?